Ehud Olmert was born in Nahalat Jabotinsky (today part of Binyamina) in 1945, the third of four sons. His father, Mordechai Olmert, worked in agriculture and was a Member of Knesset for the right-wing Herut party (during the third and fourth Knessets). Olmert served in the Golani Brigade and was also on the staff of the IDF’s Ba Machaneh newspaper. Olmert, who studied law, began his public activities during his student days at the Hebrew University as a member of Herut’s student organization. In 1966, Olmert joined Shmuel Tamir’s Free Center party, which ran as a faction within the Likud. In 1973, Olmert was elected to the 8th Knesset at age 28, making him the youngest MK at that time. In his early days as a Knesset member, he focused mainly on fighting corruption and organized crime. He was reelected to the 9th, 10th, and 11th Knessets, as part of the Likud list. In 1985, Olmert officially joined the Likud party itself and served as a Likud MK during the 12th, 13th, and 14th Knessets. From 1981 to 1988, he was a member of several Knesset committees: foreign affairs and security, finance, Knesset, and education. From 1988 to 1990, he served as a minister-without-portfolio for minority issues in Yitzhak Shamir’s national unity government. Following the dissolution of the government, Olmert became health minister in the Likud government and held that position for two years, during which time he initiated a broad reform of the healthcare system. In 1993, Olmert ran for mayor of Jerusalem, against long-time, legendary incumbent Teddy Kollek, and won by a large margin. Olmert was reelected mayor in 1998. In 1996, Olmert stood trial on charges of breaking the Party Funding Law as Likud party treasurer during the 1988 elections. He was eventually cleared of all charges. In September 1999, Olmert ran for Likud party chairman but came in second, by a large margin, to Ariel Sharon. Following the elections for the 16th Knesset, in January 2003, Olmert was appointed minister of trade and industry and deputy prime minister in the Sharon government. As a result, he resigned as mayor. Eventually, Olmert also became communications minister. During the so-called “Greek Island Affair”, Olmert was investigated on suspicions of accepting bribes from businessman David Appel. The government’s legal advisor decided to close the case in April 2004, due to lack of evidence. Olmert was one of the biggest supporters of Sharon’s disengagement plan . In August 2005, Olmert was appointed acting finance minister, in the wake of Finance Minister Binyamin Netanyahu’s resignation. Three months later, the Knesset voted to approve Olmert as finance minister. In November 2005, Olmert announced that he was quitting the Likud and joining Kadima, Sharon’s new party. 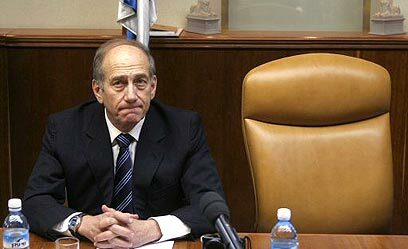 On January 4, 2006, as a result of Sharon’s medical incapacity, Deputy Prime Minister Olmert became acting prime minister. A short time later, Olmert was appointed Kadima chairman and became the party’s first prime ministerial candidate. Under his leadership, Kadima, with 29 seats , became the largest party in the 17th Knesset. In April 2006, 100 days after being hospitalized, Sharon was declared “permanently incapacitated” and thus unable to continue serving as prime minister. As a result, the Israeli government approved Olmert’s appointment as prime minister. In May 2006, following the conclusion of the coalition negotiations, Olmert’s new government was approved by the Knesset, and he was sworn in as prime minister . In September 2008, Olmert resigned from office due to the police's recommendation to indict him in various corruption affairs and following former Foreign Minister Tzipi Livni's election as Kadima chairwoman. He was replaced as prime minister by Benjamin Netanyahu following the 2009 elections. 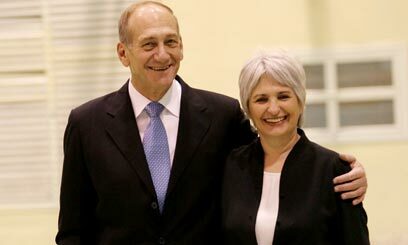 Olmert is married to Aliza, a writer of novels and theater plays, as well as an artist. The couple has four biological children and an adopted daughter.